Surround the Crowd. Magnum Club Smoke is a unique two-head fog package with a remote, ground based fluid supply. The two compact fog heads (each with a 1000W heater) deliver a continuous, high volume of dense white fog. Use remote XLR socket Pin 1 GND and Pin 3, 0-10v input. This pin needs 1.5v to heat the machine and 2-10v to run the pump when up to working temperature. The machine should be located in a well-ventilated area with a minimum of 200mm air space around the sides and top of the machine. The machine should only be used on level surfaces. The initial smoke output of the machine is hot, so the front of the machine should at least 1 metre from surfaces or people. Never leave the machine running unattended. Do not install above people´s heads. 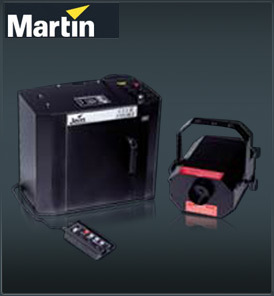 The Martin Magnum Club Smoke System is a two head smoke package with "ground based" fluid supply specifically designed for club installations. The "crack" created during the initial burst of smoke is caused by the pump pressure overcoming the incredible back pressure of the heat exchanger. Jem´s unique Soft Start Electronics gradually powers the pump, eliminating this crack and ensuring a quieter and smoother operational level following initial start up. Jem was the original pioneer of EPR, an intelligent means of warning of a drop in temperature which could result in ´wet smoke´ (residue). The pumps respond to this signal by running slower and pumping less fluid, thus allowing the heaters to restore optimum operational temperature. This guarantees a continuous flow of smoke using highly efficient, lower wattage heaters. This reliable remote offers more than the usual auto timer and smoke level output controls. Easily engaged, the timer gives complete adjustment for both ´Fog On´ and ´Fog Delay´ modes. These timer functions can be expanded even further by engaging Jem´s unique ´8X Mode´ which multiplies the selected timer setting by eight. Whether you´ve run out of DMX channels or simply want to link two smoke machines together and operate them from a single remote, Jem´s analogue link facility is the solution. This feature even allows multi-machine connection, making operation a simple one-finger action. This small yet crucial component is the last line of defense against catastrophic failure. Other manufacturers still depend on cheap plastic whereas Jem´s DTPD is made from a solid ceramic composite. This guarantees extremely precise overheat monitoring and is unaffected by ambient temperature changes.